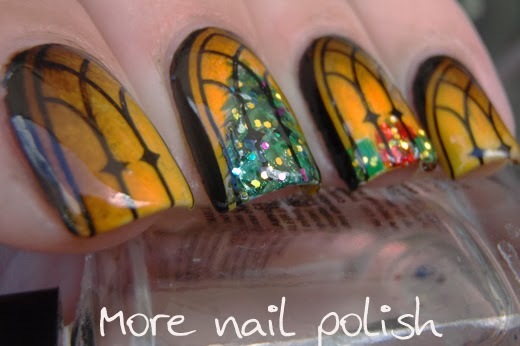 Here are my nails for the final week of the Nail Polish Canada Holiday Nail Art Challenge. This weeks theme is Holiday Memories, which means you can pretty much do anything Christmas or holiday related, whatever gives you that warm fuzzy feeling this time of year.. I chose to be inspired by one of our favourite holiday memories/activities, which is driving around to see all the houses lit up and decorated. I also love seeing houses that are all dark, and just a glowing light coming from within and a lit up Christmas tree twinkling in the window. I tried to represent that on my nails. Looking through some gorgeous windows to a lit up room glowing with candlelight, a tree twinkling with lights and some presents sitting wrapped on the floor. I did my gradient using Ulta 3 Chocolate Cake, Atomic OJ and Hololulu. I painted the tree freehand using a whole bunch of different greens. The presents were painted using Pretty Serious Santa's Sunburn and Ulta3 Frog Prince. To decorate the tree and the presents I used some very small loose glitters and didn't some glitter placement in gold and some random placed glitters in blue, purple and green. The window stamp is from Messy Mansion Plate MM01, stamped using Born Pretty Store Kand Nail black stamping polish. 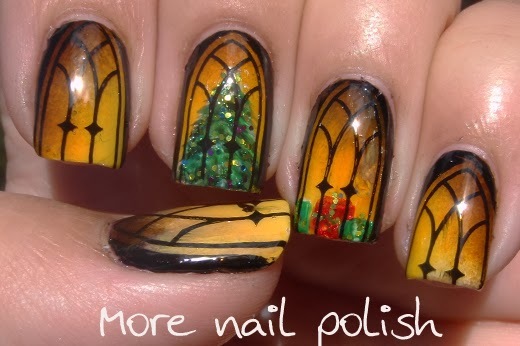 Don't forget, if you want to see some great nail art you should check out the other entries. You can also vote for your favourite. If your favourite happens to be mine, then thanks for the vote! If you also feel like entering, you can still register for this last week of the challenge and create something inspired by your Holiday Memories. *EDIT - Thank you so much everyone for your lovely comments below and also to everyone that voted for me! I'm so excited to have come in second this week! Thanks so much! Whoa that is incredible art! Yes, this design is worth the first price! amazing work! I like that it has a depth. This is incredible! I literally gasped when I saw the picture in my bloglovin feed. AMAZING job! This is so cool! I love it! The gradient really makes it look realistic. Amazing. A cool idea and a great design. 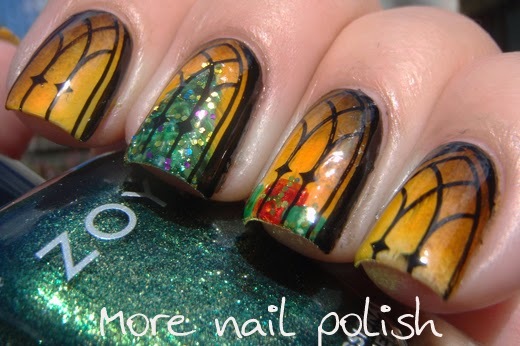 Wow, this is such a gorgeous manicure! Oh My Goodness these are absolutely stunning!!!!! You've really created something incredible there. 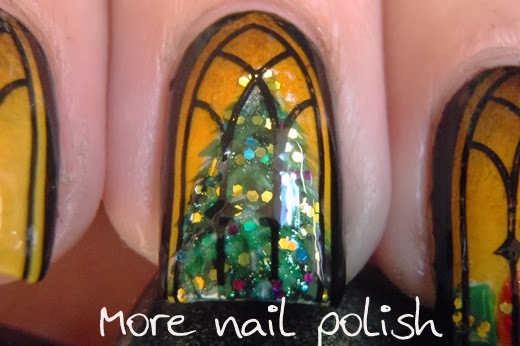 wow, this is gorgeous, Hope you win this challenge! Very well done! You did such an amazing job..! It's realistic and the gradient is perfect! I love everything about it, you nailed it! Holy wow, that is awesome! 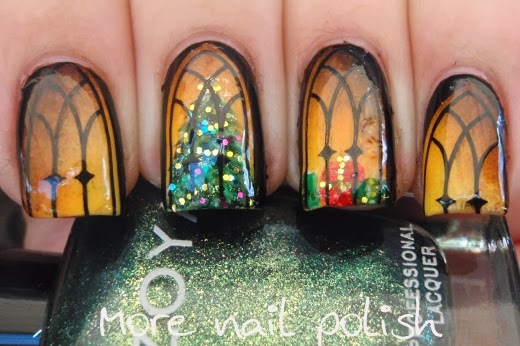 This is my favourite holiday manicure I've seen this year! My jaw has literally dropped. You can practically see the candle light flicker! We're not worthy! LOL Just amazing. Wow Cathy this is spectacular!!! holy shizzz this is amazing! Uau uau uau !!! Linda esta unha!!! Parabéns!!! I love these nails more than I can say! 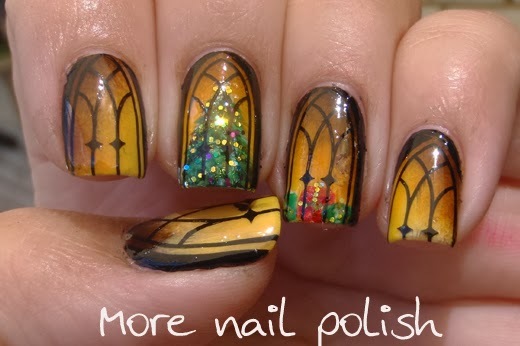 This is my favorite holiday manicure I have seen this year! Absolutely amazing design idea and beautifully done!! Yeah, these are fabulous. You win! Really so beautiful; well done. How did you do your gradient? Sponging or other technique? Is it just from dark to light from your cuticles to the nail tips, or did you do it taking into account direction the light was coming from? I can't tell for sure...but however you did it, you definitely nailed it! Hi Iroshi - I did try to angle the gradient so that the fire would be behind the tree and presents. I just used a sponge on did it on an angle. I used a white base and put all the gradient colours on my sponge and dabbed away. I did about three coats of the gradient to get the colour right. Thank you! 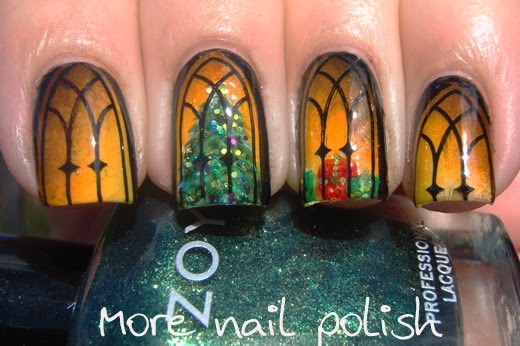 This nails are just beautiful and perfect for christmas!